The head of Lockheed Martin’s UK operations remains confident the UK will commit to buying a further 90 F-35 Lightning II fighter aircraft, despite funding concerns at the MoD. A retired RAF air marshal, Peter Ruddock, told the Press Association that he was “respectful” of the Ministry of Defence’s budget shortfall, which estimates say could be as much as £21bn. 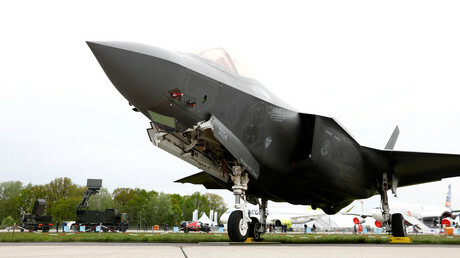 He also warned that by cutting F-35 orders, the UK would be running the risk of a capability gap. Ruddock’s comments come as reports in the Daily Telegraph suggest that the Government and MoD is considering a reduced buy of the F-35, putting a potential order of 90 additional aircraft into doubt. Instead, the RAF may purchase the significantly cheaper Eurofighter Typhoon, an aircraft already in use with the service and made by Eurofighter, a consortium that includes UK defense giant BAE Systems. At the latest estimate, the cost of a Eurofighter and the fifth-generation F-35 comes in at £87 million and £197 million respectively. So far, the UK has paid for 49 F-35s at a cost of £9.1 billion to the taxpayer. Defence Secretary Gavin Williamson announced Wednesday that the first batch of four F-35s will touch down in the UK later this month. The fighters will be based at RAF Marham in Norfolk but will be made available for duty onboard the Royal Navy’s new aircraft carrier, HMS Queen Elizabeth. Williamson, however, according to the Telegraph’s claims, is in favor of swapping additional F-35s for more Eurofighters, an option that would ensure the viability of a joint European jet fighter business until 2050 at least. This leaves Prime Minister Theresa May with a decision to either back her minister and face the ire of a certain US president when they meet next month, or stick with the original spending plan. BAE’s Eurofighter production is based at its Warton plant, near Preston, Lancashire and employs between 5,000 to 6,000 people. Its backlog currently consists of a 24 unit Eurofighter order for the Qatari Air Force with first deliveries expected to start in late 2022. But UK firms are also benefiting from being members of the F-35 program. This week, US Ambassador Woody Johnson praised the “amazing” F-35, adding that many of the components were being produced in the UK by BAE, providing thousands of jobs and an estimated £13 billion to the UK economy over the life of the project. “Add that to the fact that significant money has been spent on two carriers, two very large carriers – there is a very strong commitment to having those carriers available or at least one of those carriers available at all times,” he added. A decision by the MoD on the future of the F-35 is expected to be made after Williamson publishes a long-awaited defense review in July, which aims to address the department’s spending gap and adjusted procurement plans. Also due this summer is a Combat Aircraft Industrial Strategy, which will give a decision on future jet fighter spending and whether London will, even with Brexit, pursue another joint European fighter effort, or go with a US-developed jet warplane.